Dive bombers, as the name implies, were aircraft specializing in delivering bombs using a diving attack. By flying along a steep trajectory that closely matched that of the bomb, the dive bomber eliminated much of the error in aim in the direction of approach. As a result, a well-trained pilot could hit his target better than 50% of the time, and the superb Japanese Navy carrier pilots achieved a hit accuracy of better than 80% against the British carrier Hermes and cruisers Cornwall and Dorsetshire in early 1942. It is a measure of how badly Japanese pilot skill deteriorated that, by the end of the war, the remaining pilots were hitting their targets only 10% of the time. Overall, dive bombers scored 20% hits against stationary battleship-sized targets during the war. A more scientific measure of accuracy is the circular error probability, defined as the radius of the circle around the target in which 50% of the bombs land; CEP for dive bombers during the Pacific War varied from 50' to 210' (15m to 64m). Part of the wide variation in effectiveness of dive bombers can be attributed to the importance of leadership. Dive bomber formations on both sides attacked in 20- to 30-second intervals behind their leader. If the leader came close to the target with his bomb, the pilots behind him could easily adjust their aim and have an excellent chance of scoring hits. If the leader was wide of the target, the entire squadron might miss the target. Operational researchers in the Marshalls during the summer of 1944 studied the CEP for dive bombing against land targets in actual combat. It may be the case that land targets were harder to correctly identify to achieve hits than naval targets: Marine SBDs had a CEP of about 175' (53m) while F4Us configured as fighter-bombers had a CEP of 195' (59m). Hit probability was little worse at a release altitude of 3000' (900m) than at 1700' (500m), an important discovery given the threat of concentrated Japanese light antiaircraft fire. The best naval dive bombers in the Pacific War could maintain a dive angle of perhaps 70 degrees. A dive this steep could easily build up enough velocity for the aircraft to become impossible to control: As the speed of the air flow across some control surfaces approached the speed of sound, the control surfaces became useless. To avoid this difficulty, and to ensure that the aircraft could pull out after dropping its weapon from an altitude low enough for accurate bombing, dive bombers were generally equipped with some form of dive brake. This usually took the form of a special set of flaps that could be extended perpendicular to the air flow to create considerable wind resistance and reduce the terminal velocity of the aircraft to an acceptable value. In addition, the wings had to be very strong to endure the stresses encountered during the pullout maneuver. Japanese Navy dive bomber pilots were trained to approach their target at medium altitude, typically 12,000' (3600m). If more than one formation of dive bombers was attacking at the same time, the formations would attack from headings spaced 10° to 20° apart, in order to box in the target. The pilot then dived at his target at an angle of at least 50 degrees, aiming his aircraft through a telescopic sight while his radio operator called off the altitude from the altimeter. The radio operator called out "Yōi" ("Ready") at 2000' (600m) and "Tei" ("Launch") at 1300' (400m), the release altitude. After releasing his bomb, the pilot pulled out an an altitude of about 500' (150m). At the time war broke out, dive bomber pilots had to release their bombs by pulling back on a lever. The Americans discovered that the pilots tended to instinctively pull back on the control stick at the same time, throwing off the bomb aim. Beginning in 1942, American dive bombers began to be equipped with an electric switch on the control stick that allowed the pilot to release his bomb simply by pushing a button. This improved accuracy, but the system was initially buggy, and some of the dive bombers at the battle of Midway lost their bombs in flight when they attempted to arm the release mechanism. Although dive bombing was originally developed as a means of accurate delivery, the attack profile of a dive bomber also posed difficulties for antiaircraft defenses. Once committed to its dive, a dive bomber was almost immune to fighter attack, since fighters had great difficulty matching such a steep dive and had no dive brakes to prevent them overshooting their target. Heavy antiaircraft shells with timed or hydrostatic fuses were almost useless because of the extreme difficulty of correctly estimating such a rapidly changing range to target. On the other hand, dive bombers were vulnerable to light antiaircraft fire, though the rapid pullout maneuver gave them some protection once they had released their bombs. Most dive bombers carried a bomb weighing up to half a ton (500 kg). Once this was released, many dive bombers were theoretically nimble enough to act as fighters against heavier aircraft, such as torpedo bombers. A number of SBD Dauntless dive bombers were employed in this manner against B5N Kate torpedo bombers during the Battle of the Coral Sea, with limited success. Because they were maneuverable for light bombers, and had an attack profile that limited their exposure to antiaircraft, dive bombers had a relatively low loss rate. 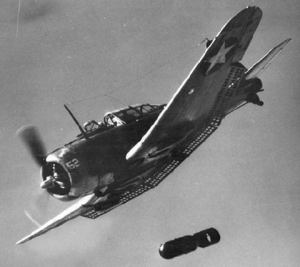 Incredibly, the SBD Dauntless is claimed to have inflicted more aircraft losses on the enemy than it suffered itself. Whether or not that is true, the Dauntless had a very low loss rate and remained popular long past its nominal obsolescence date. The use of dive bombers against land targets in the Pacific was much less successful than their use against shipping. Ships are very valuable targets, and a loss rate considered acceptable in an antishipping role was unacceptable in a ground support role. Furthermore, the heavily jungled terrain in much of the Pacific made target identification from the air difficult. This was a disappointment to tactical theorists, who had concluded between the wars that artillery could not keep up with mobile forces and that dive bombers would take the place of artillery. This view was expressed by Kenney in the Southwest Pacific when he boasted that "The artillery in this theater flies." The bloody struggle for Buna exploded this claim. Curiously, a number of aircraft not normally thought of as dive bombers were pressed into the role, sometimes in the design stage, and sometimes in the field. We list only dedicated dive bomber designs below.